It’s time to rethink what you really need a stock to do. It’s time to rethink what a stock can do. It’s time to reject the status quo, the compromises we all have taken for what is, rather than think about what can be. The AR as a compact platform, has always felt like an amalgamation of ad hoc fixes rather than a dedicated system of components designed from the ground up to work in harmony with the shooter. 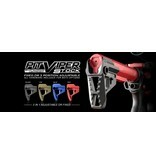 Once again, Strike Industries has the solution: the Pit Viper stock system. The Pit Viper is designed to work in concert with the Advanced Receiver extension. By interfacing with the keyed receiver extension, the additional points of contact results in a fitted feel and rattle free, rock solid lock up. Despite the additional strength, the minimalist design weighs only 4 oz. In this case, minimalist does not mean feature free. The stock can be adjusted out to three positions to create a more custom fit for the shooter. Ambidextrous QD swivels are built in for a strong, integrated solution. The orbital stock shape, introduced with the Viper PDW, creates an ergonomic, secure shoulder weld, even in the unorthodox shooting positions characteristic of vehicle born, or extreme close quarters conditions the form factor is designed to dominate. Pair with the upcoming Viper Enhanced Pistol Grip (PDW angle) for the ultimate ultra-compact, yet ergonomic, AR15. - Not compatible with mil-spec or commercial buffer tubes. Only compatible with Strike Industries 7-Position Advanced Receiver Extension. - Note: This is considered a buttstock. Not a pistol stabilizing device. Caution: Not recommended for use while mortaring firearm to clear malfunctions. - Lighter than a mil-spec m4 stock but 2x more durable. 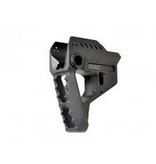 - Skeletonized and low-profile design ideal for lightweight builds and short-barreled firearms.